One of the most difficult aspects of graphic design is color management. It’s one of those things you know you should do, but often overwhelms all but the most expert of users. Thankfully, Pantone offers ColorMunki Design, a $499 suite of tools for designers to ensure accurate color from design to output. 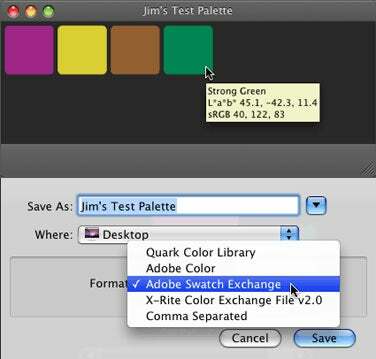 The hardware/software combination allows you to calibrate your monitor and printer, as well as capture and create colors for use in your favorite print and Web design applications such as QuarkXPress, and the Adobe Creative Suite. When I first unpacked the ColorMunki Design, I was skeptical. While I have used a spectrophotometer (a device for measuring light intensity) in the past, I always found that the difficult part was using the color information it provides to improve my workflow and color accuracy. Pantone couldn’t have made color calibration easier with the ColorMunki. My wife actually used the device to calibrate her monitor, and she has absolutely no graphics or color calibration experience whatsoever. In fact, I had a hard time prying the device from her hands once she started playing with the software! Getting started with ColorMunki Design was as simple as plugging it in to an available USB port, and installing the software. Once completed, the first task is to calibrate your display. 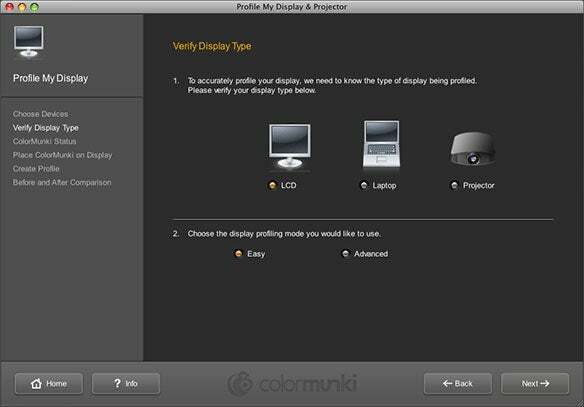 Display calibration is quickly accomplished by draping the ColorMunki unit over your monitor, and running the calibration module of the ColorMunki software. You’re presented with a few screens which ask what type of display you have, and which display (if you have more than one, or use a projector) you wish to calibrate. You then sit back and wait for the unit to take readings from your screen. Once completed, a new color profile for your monitor is saved and activated. Advanced calibration features also allow you to use the ColorMunki unit to measure the ambient light in the room before calibrating, as well as fine tune any adjustments to your display’s brightness and contrast settings. The display calibration process takes just a few minutes. When done, you can even have the software remind you to re-calibrate at specified intervals, to make sure you’re always working in a color-accurate environment. As if it weren’t easy enough, the software offers visual cues to help you along the way, as well as brief videos. So there’s really no way to mess up. Calibrating my inkjet printer was just as easy as my display. 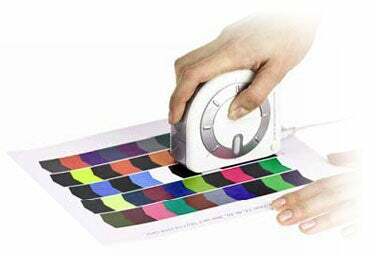 You simply run the printer calibration module to print out a color chart. Once the ink is dry, you run the ColorMunki unit over the printed out color chart. Once again, the software offers visual cues to help you along the way. The hardware then communicates this information to the software, which makes adjustments to your profile information. 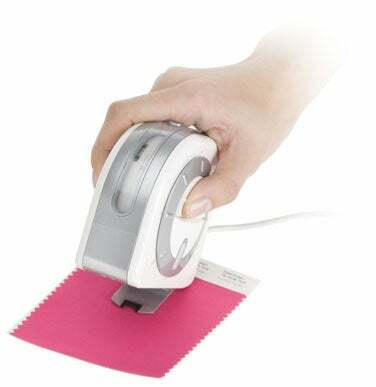 Finally, you print out a second color chart and repeat the scanning process to verify the readings and make final adjustments. Once completed, you can be sure that what you see on your screen is what you will get when you print. You even have the ability to optimize your profiles based on spot colors to achieve the best results for the type of work you’re printing. In my tests, I was pleasantly surprised at how much more accurate the printouts were on my inkjet printer compared to past printouts where colors were either much more vibrant or dull compared to what I saw on screen. Perhaps the most useful tool of ColorMunki Design is the ability to use the device to capture colors from virtually any substrate. Simply set the device target on top of anything with color and push a button—after a quick, accurate scan, the device imports the resulting color into the ColorMunki software, adding it to a palette for you where you can check the RGB, CMYK and even Pantone color readings. In my tests, the ColorMunki Design was dead-on accurate when I scanned a number of color chips from the Pantone Color Bridge books, including Pantone 5463 (a blue so dark that it appears black to the naked eye for most people) and several other more subtle colors. Every Pantone color chip I scanned, the software accurately identified. I then scanned several brochures that I had created in the past to see just how accurate the color readings would be (since I knew exactly what CMYK values I used to create the colors). Again, the results were nearly 100 percent accurate every time, with a few minor exceptions where it was only two or three percent off. But you aren’t limited to ink-on-paper samples. I also scanned the dark red color from the Coca-Cola can I had on my desk. When the color palette popped up in the software, I held the can up and was amazed at how accurate the resemblance was. If you’ve been designing for a living long enough, you’ve no doubt run across a client or two who has a printed piece for which they want you to match the colors of, but have no idea what those colors are. The ColorMunki Design puts an end to the dilemma, possibly saving thousands on ruined print jobs. 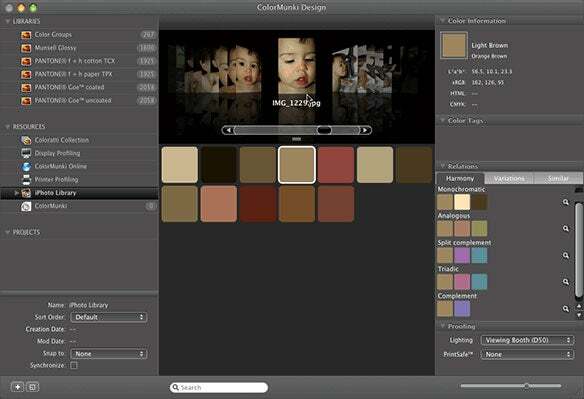 With the ColorMunki Design software, you have the freedom to create custom color palettes with ease. 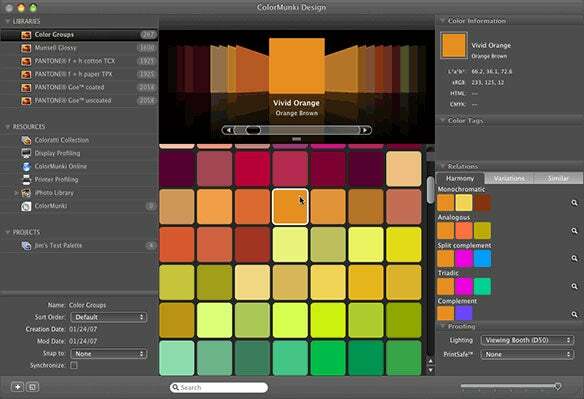 Start with a base color by scanning something in, create a new color on your own, or choose a color from the built-in Pantone color palettes; then watch as the ColorMunki software creates color palettes based on harmony, variation and similar colors. The software can then optimize the preview for CMYK or spot color output, evaluate what the colors look like under different light sources, such as outdoor or tungsten lighting, and even show you out-of-gamut color for different printer and paper combinations. But the fun really starts when you select an image from your hard drive, or use the built-in iPhoto integration, to build custom color palettes based on the colors used in the image. You can create color palettes from existing images in two ways. If you simply need a quick color palette based on the image, select the image and watch as ColorMunki builds a palette based on the colors used in the image. As you can see in the screenshot above, I chose a photo from my iPhoto library— a close-up of a baby’s face—and ColorMunki quickly built a palette of colors from the image. Because it’s a close-up of the face, all the colors are created based on skin-tones. In the image below, ColorMunki built a palette from a more colorful hummingbird feeder image from iPhoto. As you can see, all the main colors of the image can be found in the palette. Note that I have selected a dark red area in the image with the eyedropper tool. This causes the software to offer me similar colors to the red I selected in the form of Pantone colors, as well as other color library selections. You can see the similar colors in the lower right of the screenshot. 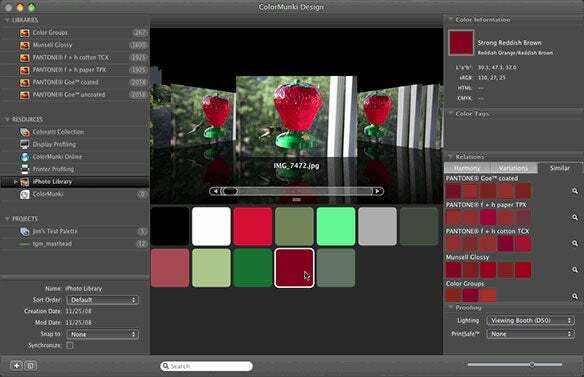 ColorMunki offers a number of ways to easily share your color creations both online, and with other desktop programs. Pantone offers the ColorMunki Palette, a community site for sharing user-created color palettes. Once you create your account, uploading your palette is as simple as selecting upload from a menu. From the site, you can download color palettes created by other users or simply browse for ideas. If you’re working with QuarkXPress or any Adobe Creative Suite application which allows the import of color panels, you can export your palette from the ColorMunki software to a format easily imported to your design app of choice. Forget about the tedious task of using the eyedropper tool in Adobe Photoshop and writing down color percentages for manually adding to all your design programs. I found it handy to create color palettes of CMYK and Pantone spot colors for each client. Pantone ColorMunki comes in three flavors, each requiring at least Mac OS X 10.4, a USB port, and Web access for updated software downloading and palette sharing. ColorMunki Create is the $149 basic package, which includes a colorimeter for calibrating your display, and the basic ColorMunki software allowing you to create and share color palettes. You can’t measure ambient light when calibrating your display, nor can you calibrate your printer. You also don’t have the ability to capture colors from exterior sources, optimize spot colors, or choose from different whitepoints (lighting conditions). ColorMunki Design—the version I’ve detailed above—contains a spectrophotometer, allowing you to not only calibrate your monitor and printer, but scan colors from various substrates. ColorMunki Design also allows a single user to install the software on up to three computers, making it perfect for the designer who has a desktop, but also takes work on the road. You have a lot of flexibility with the Design package, and it’s probably going to be the most popular version. ColorMunki Photo has everything found in the Design package, and also offers additional image optimization tools and printer profile enhancements for grey balance, flesh-tones and B&W images. The Photo package, which costs $499, also allows installation on up to three computers.